"The Gem of the Hills"
Surrounded by gently sloping hills in an otherwise flat state! ​And home to the Citrus Tower. So come visit and enjoy some Florida hills! Breeders like myself can now take advantage of the information available to improve and enhance performance. In tests of learning, stimulated pups were found to be more active and were more exploratory than their non- stimulated littermates over which they were dominant in competitive situations. 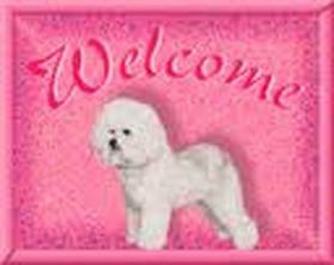 AKC/ACA BICHON FRISE'! They are played with and handled DAILY!! We are VERY Blessed to have and to raise these BEAUTIFUL, INTELLIGENT, FUN dogs! WITH THE RIGHT BREEDER ! ***All of our pups are exposed to a home environment! We are with them as they are born in our home. We were searching for a breed of dog that was HYPOALLERGENIC, GREAT for those of us that love animals inside but have allergies. They are great with ALL family members, and VERY fun to be with! There is never a dull moment with a BICHON in the HOUSE!! **This breed of dog is a small, sturdy, lively dog, projecting an air of dignity and intelligence and it makes a GREAT companion and a pet friend due to its temperament that should be stable, outgoing, and alert!! 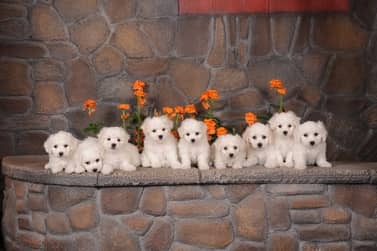 All of our BICHONS ARE REGISTERED and I stand behind my pups and they all come with a written 1 Year Health Guarantee! I like to keep a relationship with the new owners! I will be revising my spay and neuter clause contract accordingly! *Dr. Karen Becker has MANY helpful health and educational videos for your pet on YOUTUBE. **Please do your own research before even considering giving this to your pet. Pet owners whose dogs have suffered severe adverse reactions are asked to report them to both the drug maker Elanco at 888 545 5973 and the FDA at 888 FDA VETS. I can't say enough about what great breeders you are! You take such great care of the puppies. You are so patient and so loving. Your home is immaculate, the puppies are so loved. Milo is helping me to stay alive. I wanted to give you an update on little Nee-Nee. He is such a happy puppy! He goes to work with me during the day and gets tons of attention and love from both co-workers and students. He plays daily with the neighborhood kids and is becoming very well socialized. ​ Such a sweet boy! This is all possible to you and your family for the amazing work you do as the BEST breeders in the state of Florida! I am so impressed with the time, love and care you provide for each puppy. Your adult Bichons are amazingly well behaved and cared for. The work you and your family does is immeasurable - I can't begin to thank you enough for helping me find my puppy and his forever home. First let me start by letting you know how happy we are to have met you and your family. After searching the internet, we were fortunate enough to have come across your site and we’re practically neighbors! When my family met your family, we knew that this was a dream come true. You welcomed us into your home and never made us feel rushed in our decision. Your love for the animals is very apparent and it shows from the moment you walk in. We were so impressed after meeting Stelli’s parents at your home. When you brought her daddy over to interact with the babies, we were so happy to see how gentle he was with them. We are now ready to add another addition to our family and we wouldn’t even consider any other breed OR breeder! Once again, you guided us every step of the way and we’re looking forward to bringing home Kinglsey. The greatest gift to me from the Best Breeder in the whole world and the Heavens! ​ Finding you Stacy, after years of research & looking was the best thing that ever happened to me. Everyone wants to know where I got such a perfect, socialized, healthy, loving sweet Bichon. Veterinarians even remark how perfect he is. My 5 month old pup is everything the breed is bred to be. There is none like you & how you care for and raise your dogs. I truly thank you for my little Mo. beautiful, well behaved Bichons! ...never seen anything like them. ​ I will try my best to live up to your standards. Peggy F. from Cape Coral, Fl. Thank You for being such a great Dog Mom. 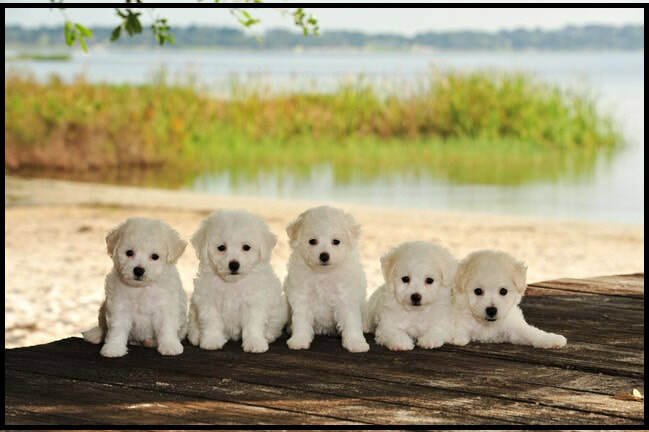 You put so much Time, care and Love into your Blessed Bichon Puppies. We realize you know God and Love God. We too have claimed Him as our Lord & Savior for over 44 years. God blessed us so much with our Sweet Alpine for 17 1/2 yrs. He was the Love of our life. We know God had his hand in Larry finding you on the internet. We also feel God told us which of the 3 boys would be the perfect fit for our family. I pray in the dark every AM for Alpine & will for Aspen as well, that God will keep him healthy and happy and you can be assured we will do everything in our power to keep him that way for as many years as God gives him to us. We LOVE little Aspen already and he isn't even in his forever home yet with his new Mama and Dada. We will keep you posted on his progress as he grows up. He is in the Best hands ever.... Both God's & Ours. Wanted to finally get back to you. 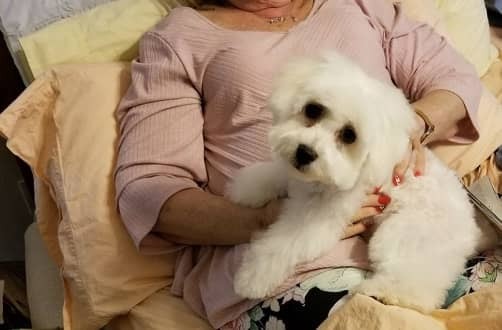 About a month ago I spoke with you asking for you to hook me up with a Bichon owner to get advise on a Veterinarian, well one of your customers from Ft. Myers did. So I wanted to thank you very much. 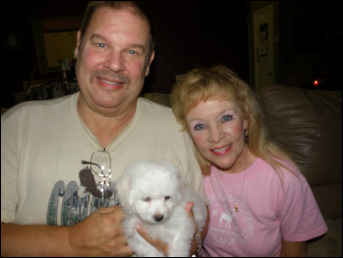 You took time from your busy schedule to help a Bichon owner & lover. Everyone that admires my guys and want to know where they can get one I tell them about you! 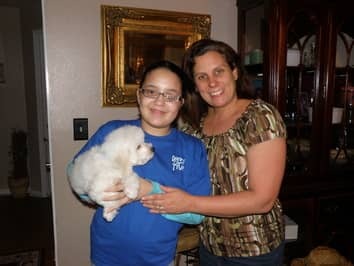 The Blessed Bichons & "Dreams Come True Foundation" were able to help Alyson's DREAM COME TRUE with a Bichon puppy. 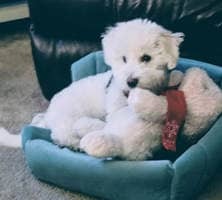 Alyson has been very sick and recently got released from the hospital and got to take her Bichon puppy " Brooks" home with her. Thank you so much for sharing the pictures and I’m so happy Brooks has a new home! Thank you so much for all of your help and I hope we can work together again in the future. There is no words to express how happy and so in love we are with Brooks. When Aly was diagnose with the brain tumor early September everything changed for her. Thanks to Brooks Rehabilitation Hospital in Jacksonville, Dreams Come True, and You, my princess is again a happy girl. The Lord has giving us the privilege of having Brooks as part of our family. He is the most lovable dog, always so playful and happy. Loves to sleep in with Aly. Brooks has put a smile in our faces and hearts!! !